If your children are anything like ours, there’s nothing better than the hotel swimming pool, no matter the destination. It’s not surprising, though, considering more and more hotels are offering lazy rivers, waterslides, spraygrounds and in some cases, full-on water parks. These are 10 of our favorite hotel swimming pools across the country. The Loews Royal Pacific Resort features a massive, lagoon-style pool that winds its way throughout the lushly landscaped property. But the highlight for kids is the interactive play area that resembles an ocean liner -- complete with water guns and cannons. 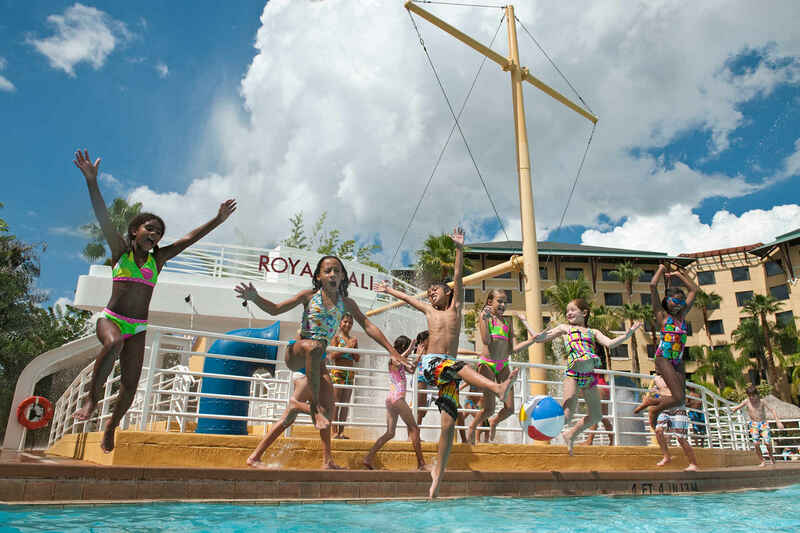 Kids can even cannonball off the "front" of the ship into the pool! The resort also features private hot tubs and cabanas -- perfect for grandma and grandma or parents and families who need a break. Bonus: The resort is within walking distance of the theme parks! The allure of Colorado's Glenwood Hot Springs Lodge is in the name. The hotel features a mineral pool so large, it expands two city blocks! The hot springs maintain an average temperature of 104 degrees Fahrenheit, and feature a kiddie section, diving pool, and even a few waterslides. 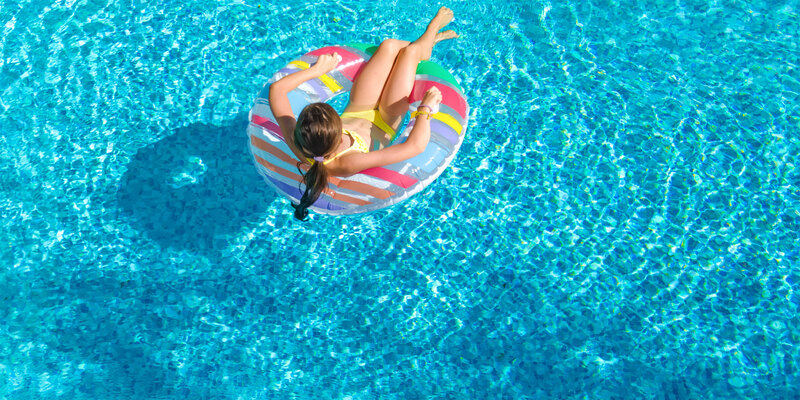 Kids are welcome to use rafts, floats, and snorkel gear, too (while parents soak in the therapeutic waters). On a hot day in Texas, there's nothing better than an old-fashioned swimming hole. 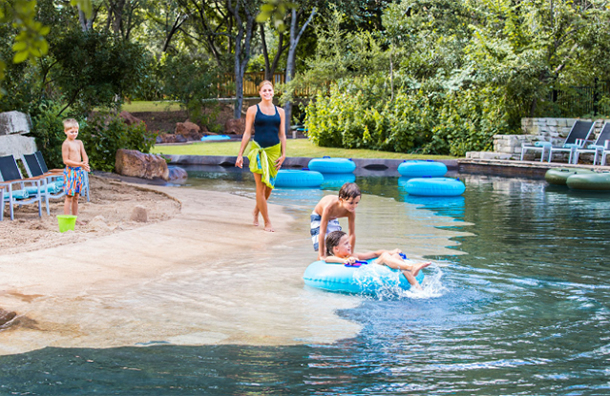 And at the Hyatt Regency Hill Country Resort & Spa, guests find that and more -- they can float on Ramblin' River (and take in gorgeous views) before relaxing on a man-made beach! The resort also features FlowRider, a surfing simulator, plus four pools, including an activity pool for games and a zero-entry wading pool for youngsters. Hyatt Regency Hill Country Resort & Spa is located less than 2 miles from SeaWorld San Antonio. What's not to love about the largest indoor water park in America? 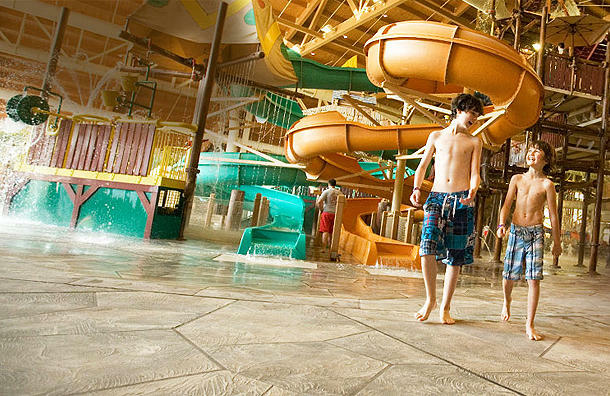 Kalahari Resort - Sandusky, Ohio has it all -- a wave pool, lazy river, interactive sprayground, activity pools, waterslides, raft rides, tube rides, a surfing simulator, and even an uphill water coaster! In the summertime, there's even more fun to be had at the outdoor water park. 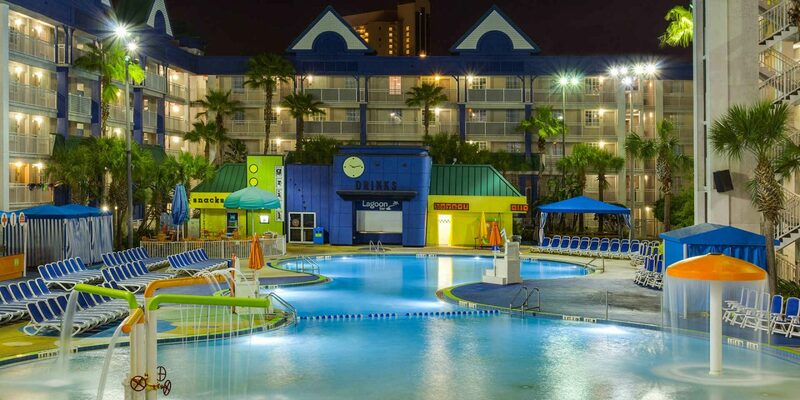 The 20,000-square-foot water complex at the Holiday Inn Resort Orlando Suites - Waterpark has it all -- waterslides, dump buckets, a splash playground, giant swimming pool, cabana rentals and more. Don't forget about the theme parks nearby -- Walt Disney World is just 1 mile away! Part of Six Flags Great Escape in Queensbury, New York, Six Flags Great Escape Lodge (across the street) offers the thrills of a theme park within the grounds of a resort. The hotel has a 38,000-square-foot indoor water park that includes Avalanche, a family raft ride; Tak-it-Eesi-Creek, a lazy river; and Tall Timbers Treehouse, a play structure with waterslides. For an additional fee, kids can test their skills on the "waves" at Boogie Bear Surf. 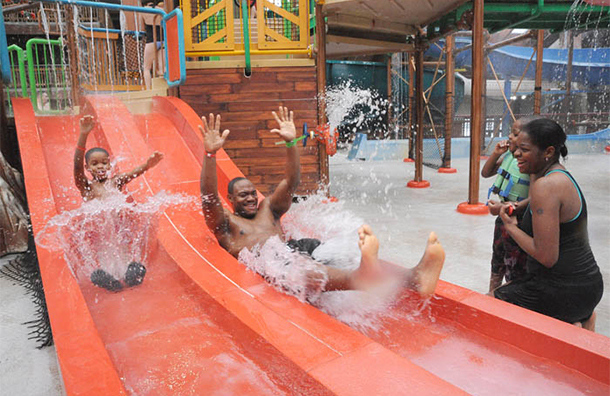 You don't have to be a hotel guest to enjoy the water park either -- day passes are available. You didn't think we'd forget Atlantis, did you? 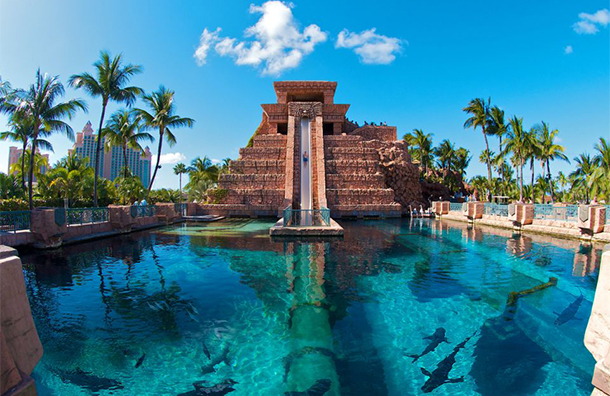 The sprawling resort features Aquaventure, a 141-acre water park with everything from slow-moving river rides to fast-paced waterslides -- including the popular Leap of Faith, an almost-vertical drop that leads riders into an enclosed tunnel surrounded by sharks! Added in 2013, the Cartoon Network Obstacle Course (which is on the water) beckons teens to test their skills, while little ones can play in three pools created just for them. Visitors also have the chance to snorkel amongst man-made ruins, and get up close with stingrays (not to mention there's a beach at the resort, too). 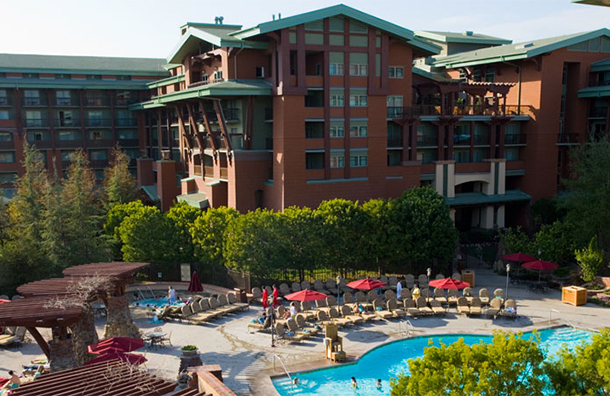 Both Disney World and Disneyland deliver awesome pools, but Disney's Grand Californian Hotel might just be our favorite. The Redwood Pool, inspired, of course, by the Redwood Forest and complete with a waterslide that resembles a tree, is almost good enough to make the kids say "Mickey, who?" It's just one part of the resort's sprawling water complex, which also features the Fountain Pool, with an artisan turtle fountain, and the Mariposa Pool, which offers private cabanas and a hot tub. Sure, you can enjoy the expansive surf along Wailea Beach, but you'll hardly want to when you see the water features at Grand Wailea, A Waldorf Astoria Resort. The hotel's 25,700-square-foot pool complex is made up of nine pools (including one with a rope swing -- channel your inner Tarzan! ), all connected by a river that varies from calm waves to full-on rapids. 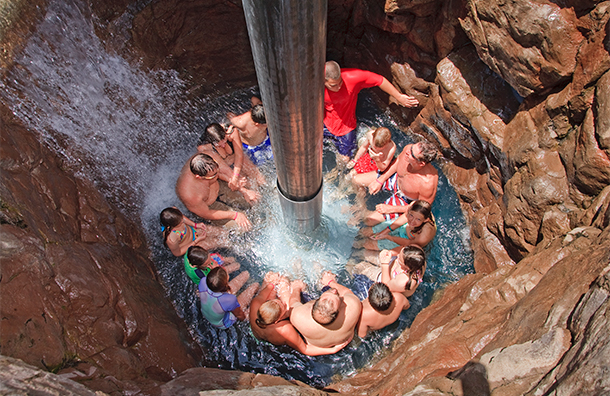 Six waterfalls, five waterslides, three hot tubs and the world's only water elevator -- a giant inner tube that spins as it rises -- round out the fun. In the self-proclaimed "Water Park Capital of the World," Great Wolf Lodge Wisconsin Dells reigns supreme. 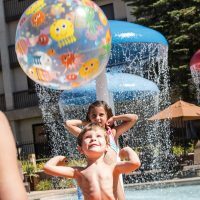 The resort features Fort Mackenzie, a four-story, treehouse-themed indoor waterpark with rope bridges, soaker buckets and waterslides. In Coyote Canyon, ride the enclosed 436-foot waterslide before landing in a splash pool, or hit Crooked Creek for a lazy river ride. During the summer months, families can play at the outdoor Thunder Bay water park.